Children&apos;s Hospital is looking to have $1 billion dollar expansion. Opponents of Boston Children’s Hospital’s proposed $1.5 billion expansion asked the hospital to disclose all the alternative locations it considered before settling on a plan to build an 11-story tower on the site of the beloved Prouty Garden. They asked state public health officials to deny Children’s application, arguing that hospital executives have not met the state requirements for proving cost effectiveness, particularly regarding poorer patients. The expansion project, which would add a pediatric heart center, neonatal intensive care unit, and private rooms, has attracted opposition from some patients’ families and doctors, including renowned pediatrician Dr. T. Berry Brazelton, who say that the half-acre garden has served as an oasis for families struggling with serious illness. Hospital administrators said they spent six years analyzing alternatives to the current proposal, and considered more than nine options, but that building the 11-story tower on the campus was the most viable, least disruptive, and most cost-effective. The Department of Public Health hearing Thursday afternoon was part of a routine review to determine whether the hospital’s proposed expansion is necessary and how it would affect health care costs. A spillover crowd of more than 200 heard three-minute statements from people on both sides of the issue. 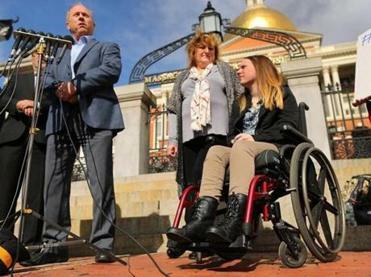 The teen spoke out at a press conference to announce a lawsuit against Boston Children’s Hospital over her care. The three public health representatives at the four-hour hearing willreport to the Massachusetts Public Health Council, which will make the final decision on whether to allow the expansion. They did not comment during the hearing. In a prepared statement, Friends of Prouty Garden spokesman Gus Murby, whose son was treated at Children’s for several years, said the hospital has not “adequately considered alternatives to its current plans.” He pointed to a 2008 hospital master plan approved by the Boston Redevelopment Authority that would have added two floors to the main building on Longwood Avenue, as well as other opportunities to buy other buildings in the Longwood area. “Patients, families, and other hospital stakeholders — including those concerned about the extreme cost of BCH’s proposed project — have a right to see the hospital’s analysis of the other sites and why they were rejected,” Murby said. In her opening statement, Sandra L. Fenwick, Children’s chief executive, said the project, unanimously supported by the hospital’s trustees, does in fact meet all the regulatory requirements outlined by the state. Fenwick said the expansion will address chronic bed shortages as the hospital treats children with ever-more complex medical needs. Last month, she said, 53 patients spent the night in the hospital’s emergency room and 124 in a post-anesthesia recovery unit waiting for beds. Dr. Kevin Churchwell, chief operating officer at Children’s, told the crowd the hospital’s primary ambulatory care unit is nearly 50 years old. “Our staff is constantly challenged by aging facilities,” Churchwell said. 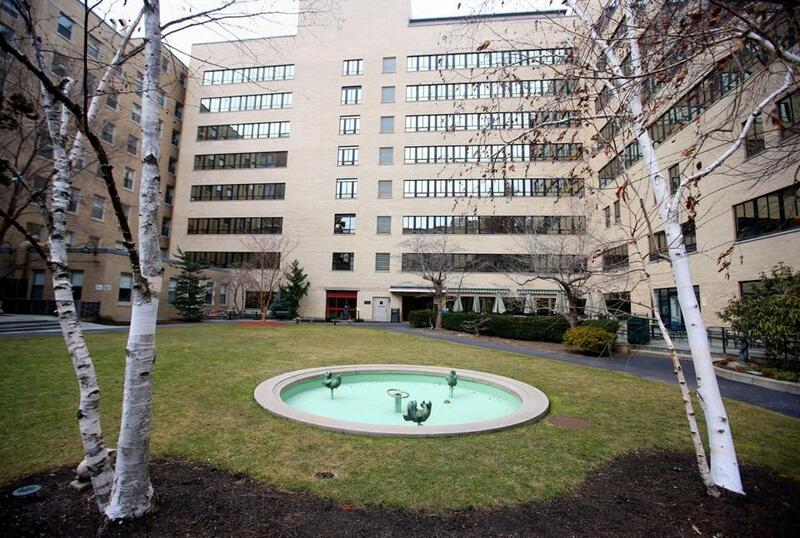 In a written response to public health officials, hospital administrators said opposition to destroying Prouty Garden is not a valid basis to deny the expansion application. “As a threshold matter, the Prouty Garden is not a licensed clinical space or service, so it is outside of DPH’s purview,” read the hospital’s response, dated Feb. 16 and addressed to Darrell Villaruz, interim manager of the state health department’s Determination of Need Program. But even if it were, closing it would not require state approval, the hospital argued. Boston Children’s Hospital is seeking approval for a 575,000-square-foot facility at its Longwood campus that will eliminate all of the hospital’s current double-bed rooms, providing patients and their families privacy, larger sleeping spaces, and showers. It will also add more operating rooms, a new neonatal intensive care unit, and a pediatric heart center. A rooftop garden and other green space will be added to offset the loss of the Prouty Garden. In addition to building the tower in Longwood, hospital officials are planning to renovate existing buildings, construct a 202,000-square-foot outpatient center in Brookline, and add inpatient hospital beds to a facility in Waltham. Public health officials will continue to accept written comments on the project until March 7.